Well let me say... I finally learned how to use the self-timer on my camera. I was determined to get a pic of me wearing my newly made skirt. Yahooooo!!! I did it after like 29 pics....lol. Now I want a tripod stand...hehe. Ok.. so I finished the skirt and initially cut it a size too big and had to tweak it. Boy-o-boy, the hemming part was tedious because of the organza with its raveled threads at the end, so I used biased tape for both layers of fabric to give it a finished look. I really like the organza because its has just enough body to stand out yet still move nicely and the cotton is cool, soft, and comfortable against my skin. 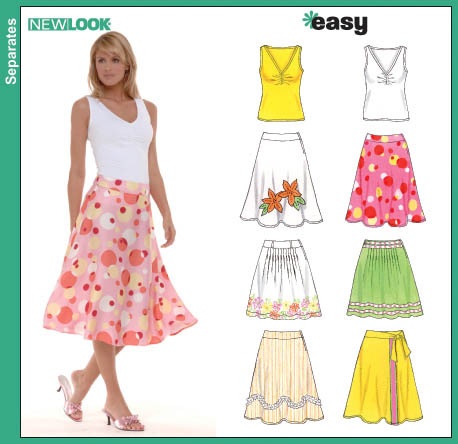 Its the perfect casual skirt...A definite repeat pattern. Look at you girl! Love it! I made that same skirt TWICE! lol Love it, and the top is easy too!!! That turned out BEAUTIFUL! -=applauds=- You look terrific in it too! Congratulations! The skirt looks great! I am sooooo loving the skirt! I am glad that you were able to finish it and the binding on the hem is inspired! Now that you got it tamed, I expect to see another version soon! *LOL* And then this will be your first TNT (tried and true) pattern!